I had just purchased a 4-plex and was excited to get into my first venture in property management. The property was located in my hometown of Detroit which I had just moved back to after graduating from college. The 4-plex was in need of some major repairs and I was ready to get going on the remodeling project. My dad and I had a pretty limited budget and we could not get what we needed at Lowes or Home Depot. A friend of ours recommended ASA Builders Supply and said they would have everything we needed such as countertops, Masonite doors, L.J. 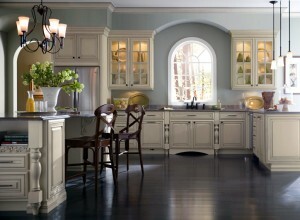 Smith stair components, vanities, and kitchen cabinets. He said their prices were better than any big box store and that’s where the builders liked to shop. He mentioned that they have been in business in southeast Michigan for more than 50 years. I figured they must be doing something right to be in business that long and haven’t gone out of business because of Home Depot and Lowes. Needless to say we paid a visit to their showroom in Walled Lake and liked what we saw. The staff was super friendly and very knowlegable. We talked to them about our plans to remodel a 4-plex and they gave us some good pointers about what type of Masonite doors would be the most durable as well as what types of countertops and cabinets would be best to put into a rental. They offered to send one of their employees to come out and do measurements and we took them up on the offer. After the measurements were done we ordered our supplies and were excited about how much money we saved compared to what we would have spent at other stores. Plus their knowledge and expertise saved us from buying the wrong kind of materials which would have cost us more cutting into our profits. I’m happy to report that we finished up with the remodeling job on the 4-plex and have had tenants living in them for a couple of months. I’m very grateful for their excellent service and prices. I highly recommend them to anyone. They have such a huge selection of doors, countertops, shelves, cabinets and mouldings that you just can’t find anywhere else. Now that our first property is fully occupied we are going to be looking for more to purchase in the Detroit metro area. Our goal is to own several more duplexes and fourplexes and eventually buy a multi-unit apartment complex. My father and I wanted to write this letter because we owe a portion of our success to the good folks at ASA Builders Supply. Even if you’re just looking to upgrade doors or cabinets in your home there is no job too small or large they cannot get you a great deal on. My wife and I were finally able to take our ten year anniversary trip, albeit three years later, to the location of our dreams: Italy. We dropped the kids off at the in-laws and were ready to go. Our experience in Italy was beyond belief. The sites, the history, the culture were everything we imagined and more. We are both really into architecture and loved seeing the intricate detail and craftsmanship put into every square inch of the buildings in that country. Anyway, after getting back home from our fabulous vacation we got right back into the groove of raising a family, working, and living a great life. About two weeks later we starting talking about how great it would be to do some remodeling of our kitchen cabinets, countertops, etc. We both were inspired by our trip to Italy and were ready to bring that look to our home. I talked with a builder buddy of mine who and told him what we were thinking. He said that Lowes and Home Depot wouldn’t meet our needs and recommended a place called ASA Builders Supply. He said that is where he buys all of his supplies. He said they have a great selection of shelves, mouldings, doors, and L.J. Smith stairs. I live in the metro Detroit area and their company is just a few miles away in Walled Lake in nearby Oakland County. My wife and I made the short drive and visited ASA cabinets showroom. When we got there the staff was very friendly, which is something you really don’t find at the big home improvement stores. Steve and Margie were ready and willing to answer all of our questions and were very knowledgeable, which helps because I’m a newbie when it comes to kitchen cabinets. I told Steve we wanted to remodel out vanities, kitchen cabinets, doors, and countertops. He gave us some great tips on where to start first and recommended we go with Masonite doors and L.J. Smith stair railings. We started with the kitchen cabinets and that project actually went a lot smoother than I anticipated. The kitchen cabinets were semi-custom designed by one of ASA builders manufactures and they fit perfectly and were just the rich, dark look that we were hoping for. The price was unbelievable too. We did some comparison shopping and found that by taking advantage of ASA builders direct purchasing power we saved hundreds compared to if we would have purchased retail. After the kitchen was done we finished up remodeling our vanities, got brand new Masonite doors, and new L.J. Smith stairs. We couldn’t be happier with how the project turned out and owe a great big thank you to the folks as ASA Builders Supply!